Some days on the water are enjoyable no matter the weather conditions, like this stormy November day. While other days the weather can be just the opposite, however the enjoyment is still there. Access ; If you are going to fish, you will have to have some sort of access to the water. This might be by public access or it could be a private one. Either way, there even could be a fee required to use the launch, parking, picnic area, etc. Some will have no fee during week days, during the summer months, but have it in place for week-ends when the crowd shows up. Pick a Lake ; Sometimes you have no great options as to which lake you can fish depending on travel & time constraints. Other times there may be a considerable number of potential lakes close by. 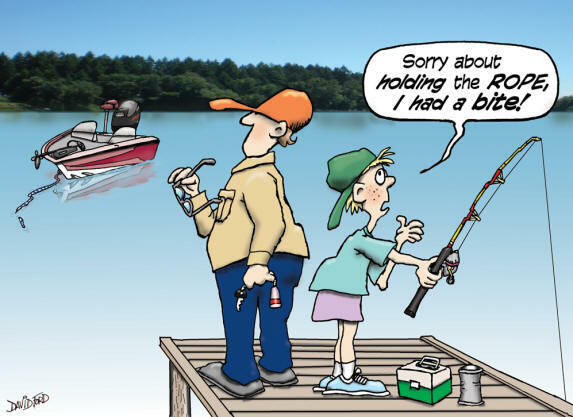 If you haven’t been fishing recently or are “out of the loop”, it may be best to consult a local sporting goods store and inquire with the counterperson behind the tackle division. I would not give a whole lot of credence to an individual who has ties to a guide service or someone associated to advertisement for a fishing publication however. Share the Area ; If during a warm summer day and the lake is allowable to be used by water or jet skiers, certain areas can get congested. This may be the time to try for a week day on the water. Other lakes may have a certain time that the water skiers can not be there or are limited in the areas they can navigate in. Boat fishermen ; Most fisherpersons usually troll when fishing a lake, especially one new to them as this allows them to explore and with the use of a depthfinder they can locate water depths, shallows and the depth of the fish, and then troll at that depth. Early in the season, I have done fantastic by just by slow tolling a fly with no weight back 150′ using monofilament line. As the summer progresses, the water temperature rises and the fish usually go deeper. Usually this depth is around 20 to 60 feet. You may be able to reach the 20′ or even the 30′ depth with a weight on your line or a diver. However if you have to achieve a depth beyond 30′, you may need a down-rigger to reach your desired depth, sure some of the divers advertise a depth to 50′, but you will need a salmon rod to achieve this thereby negating any sort of an experience reeling them in. Rods & Reels / Line ; This will probably be a very controversial section, as about everyone has his/her favorite. It will also depend on the type of fishing is intended. For trolling, probably a 7′ to 8′ 6″ casting steelhead rod would be the choice. The longer rod is of no real importance as distance is not a factor here. The rod line weight would probably be in the 8-15# category, any heavier would function, but not necessary. But if trolling is the game, then a level-wind reel would be preferable, because it is about mandatory to know how deep you are, and this equates to how much line you have out. To accomplish this with a standard reel, you need to count “how many pulls” you are out. This is accomplished by grasping the line at the reel then pulling it an arms length, (usually to somewhat beyond the first guide). This will be about 2′. If you caught a fish and you were out 15 pulls, then that is a good setting to go back to. If you do not catch anything for a while and the day has brightened up, let out another 5 pulls. This method does not work well when using a spinning outfit, as before long your line will be knarled up as the winding in lays the line on the reel different than your it pulling out. Another method similar to the above, is when using a level-wind reel, to count the number of times the line guide travels across. Most will count one crossing, NOT across and back. On most regular casting reels with a fairly full spool, this will equal about 8′. This means when you have the lure just in the water, if the guide starts in the center, it will move one way or the other and then come back to center again. Count that as 1. The only problem with this method, once you are out, can you remember just how many you let out. If you were just using the boat to move slowly along the shoreline then cast toward likely looking water with a spinning outfit would be better. It would also be preferable if you were drifting or anchored and bobber fishing. Line would probably not be that important here, so personal preference could be the deciding factor. I however prefer a monofilament of from 8# – 15# rating. Lures & Rigging ; This will depend on the lake, your method of fishing and what specie you are really targeting. For trolling, the following lures are a start. The Pop Geer brand of gang trolls are made in length sizes of 17″, 28″ and 36″ with some coming with their own keel. One nickname for the longer ones of any brand is a “Yard and a Half”. Other old time spinner attractors are the Ford Fender and Doc Shelton. Some fishermen use a small snubber on the line before the dodger when using the downrigger. This snubber is then pierced a few times on the rear, injected with a scent. The thought here is the snubber acts as a scent reservoir and leaks the scent out over a long period of time. Don’t be bashful when using worms in trying scent also. Sometimes just adding herring scent to worms will make the difference between a fishy smelling boat or not. Cocktail shrimp work good by themselves or in addition to worms. Don’t put one gear type on & troll it all day. Change lures or combinations until you find what works. Troll in zig-zags, slow down, then speed back up, use scent. If using Flatfish, check the action of the lure to your trolling speed. For these lures the speed needs to be slower to achieve the proper action on the lure. So if you are a guest in the boat and you would like to use a Flatfish, but the boat owner is trolling faster but does not understand your needs because he has never used one, it may just be best to change over and use some other lure that is not that effected by speed. What worked yesterday may well not work today. If you have a hit, don’t just keep on trolling, turn around, try for a bite from another fish as you will seldom see a lone fish, but schools of them. Try different trolling depths. Try close to a protected cove or shore that may have a pocket of some sort of fish food. One friend uses a #30 Jet Diver about 20″ in front of a Medium or Mini-Fish Flash, then a Flatfish in a watermelon or fire tiger color about 3′ behind the flasher. He trolls with about 30′ of line out. I have had success on planted rainbow trout using the same basic outfit described above except I use a Heidebrandt double blade spinner in size 6 or 7 and use either cured shrimp or Berkley Gulp 2″ minnow in Punkinseed color. The neat thing about this setup is when you hook a fish and if you miss the hook set, the fish will usually bring the whole unit to the surface. If you plan on using worms as bait, do not feed them. By this I mean that there is no need to wad a big gob of nightcrawler onto a #6 hook. All you are accomplishing is feeding the fish, as they will take off all the loose ends off and by the time they have it stripped, will not get hooked. Run a smaller worm, or at least shorten it. One thing to remember is that if these trout happen to be pen raised then released, the food that they were accustomed to eating is pellets about the size of a grain of rice. In this case give them something close to what they are familiar with. Also by doing this the hook is more accessible and not all covered up by the worm. Many times I use a larger hook possibly a #4, less bait and I get more hook-ups per bite ration. If you see schooled fish under a bridge or overhanging trees, (many times you can see them if the sun is just right), but can’t get close enough to them when trolling, stop the boat, let it drift, then cast a bobber with bait down a couple of feet. If nothing happens, change the depth of the bait. Anchored Boat Fishermen ; If they use a boat and anchor then you have a choice of the water column, which could be from near the surface to having the bait is about 2′ off the bottom. The use of a bobber would at the fisherpersons discretion in this situation. This method would be very akin to bank fishing, except you have more access. The following lures are a start for this type of fishing. 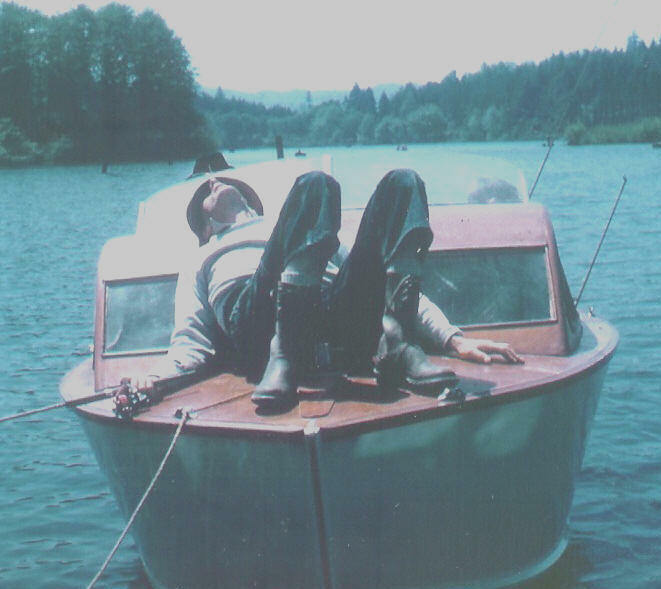 In the photo below, this gentleman had volunteered his boat for a day of boy scouts lake fishing. He apparently decided that the boys in the rear did not need his prescience. I just happened to have my camera and shared this with his daughter 50 years later. Bank Fishermen ; There will usually be more limited bank fishing areas on most lakes as compared to boat fishing. Most of the bank fisherpersons use a bobber about 30″ above the bait at these locations. Of course the underwater structure as for weeds, brush, stumps or a multitude of things will enter how you approach the intended quarry. Many still-fishermen use cocktail mini shrimp with a bit of Power-Bait. The shrimp is put in a micro-wave for a couple of minutes to toughen them up so they will stay on the hook better. Maggots & corn are other items used.